This past Saturday, Oct 22nd, we attended the 6th annual Denver Zombie Crawl, and on this day, Occupy Denver wasn’t the only one’s occupying downtown. There’s no final count as of now, but there was an estimated 16,000 to 30,000 zombies, which is more than enough to beat the Zombie Crawl record set in October 2010 in New Jersey of just over 4,093. This is the second year in a row that we enjoyed this gruesome event. Again, Chayo and I went as traditional zombies that were raised from the grave. Diego, my oldest son brought along some of his friends and they went as survivors, fully equipt with nerf guns, plastic swords and axes. They wore X’s on their shirts to make sure the zombies chased them through 16th Street Mall. It was clear that there were way more zombies than last year as it was very hard to keep track of the boys. You look away for a second to take a picture of one of the many characters present and you chance losing of one of them. A word of advice if you plan on taking children to next years Zombie Crawl. Have a place to meet should one of them get lost. Give them a cell phone so they can be reached or tell them to find a police officer ASAP. Of course we plan on attending next year, but this time I’m going to change up my character a bit. I’m not sure how yet, but I’m open to suggestions in the comments section below. 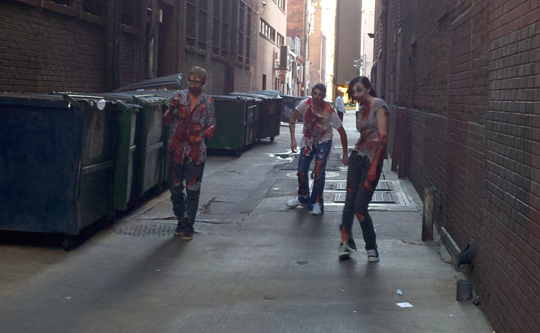 See More photo’s of the Denver Zombie Crawl 2011!